September 15, 2017 – A conservation solution to private property surrounded by U.S. Forest Service in Clay County could lead to a happy ending for everyone. 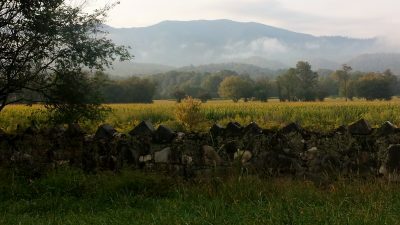 Mainspring Conservation Trust, a regional land trust serving the six western-most counties in North Carolina, has entered into a contract with four landowners to purchase fifty acres in the Fires Creek watershed, that would eventually become part of the Nantahala National Forest. Mainspring is currently undergoing a campaign to raise the funds needed to purchase the property. The 50-acre parcel is well known to many throughout western North Carolina. The owners, who acquired the inholding in 2006, drew public criticism from across the region when they petitioned the Forest Service for access to build a road to their land. Fires Creek is designated as an Outstanding Resource Water, the highest designation available in North Carolina. Over eighty-five percent of the property under contract is in the Fires Creek watershed, but it extends across the Valley River Mountains into Cherokee County. 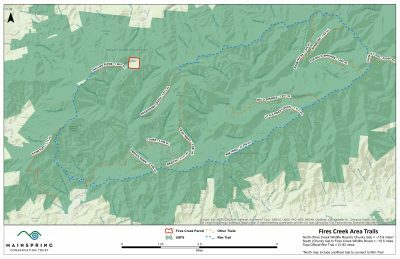 The property previously contained more than a one third-mile of Fires Creek Rim Trail, but the popular hiking trail was rerouted by the Forest Service in 2013 to bypass the private land. Peaks showing in distance include the 50 acres Mainspring is under contract to purchase. People interested in protecting the Fires Creek watershed can support the project by clicking here, where they will then have an opportunity to designate their gift for the Fires Creek project.